An Android phone with a Windows Phone-like skin? The eagerly-anticipated Nokia X Android phone moved one step closer to officialdom when it briefly appeared in a retail listing on a shopping site in Vietnam this weekend. The listing on the MaiNguyen site listed the handset as having a 1GHz dual-core processor, 512MB of RAM, a 5-megapixel camera and Android 4.4.2 KitKat on board. Those specs tie in with another leak from @evleaks on Friday, which also claimed the device would have a 4-inch WVGA display, a 1500mAh battery and would be available in six colours. Evleaks also added that Android apps will be available from the Nokia store and third-party retailers. While the hardware may not please the mobile purists, the price of the experimental device may make it worth a look. The since-removed listing had the device priced at around £70/$110/AU$120. The device, which is expected to be aimed at emerging markets, remains one of the most intriguing smartphone launches of 2014. Firstly, it'll be Nokia's first ever Android phone following years of smartphone enthusiasts and industry figures clamouring. Secondly, it comes as Nokia's transition into a Microsoft-owned company is in full swing. 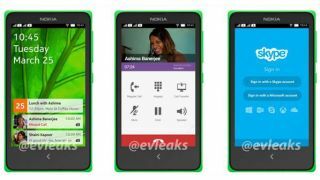 It is expected we'll get the first look at the Nokia X on the show floor at MWC 2014, which kicks off in a little over a week in Barcelona. TechRadar will be out in force to get some hands-on time with the device.